"Norma Borgoño immigrated to the United States from Peru in 1989. A single mother with two children, she set roots in the Miami suburbs, finding work as a secretary, dedicating herself to her church and, earlier this year, welcoming her first grandchild. She took the oath of citizenship in 2007, a step she felt would give her secure status in her adopted homeland. But hers, it turns out, is not a feel-good immigrant story: The Justice Department has moved to revoke Borgoño’s citizenship, an action that could eventually force her to return to Peru. Federal prosecutors in May filed a rare denaturalization case against Borgoño, 64, accusing her of committing fraud when she applied for citizenship and failed to disclose that she had taken part in a crime several years before she applied for citizenship — though she had not at the time been charged with it..."
"Migrants held in detention facilities along the Texas border claim they are being held in dirty and unhealthy conditions — with poor food and little access to health care..."
"The Trump administration is stepping up efforts to curb legal immigration, taking a series of actions in recent weeks that could lead to deportation for people already granted citizenship. The director of the U.S. Citizenship and Immigration Services (USCIS) — an office established in 2003 to process immigrant applications for visas, work permits, green cards and citizenship — told The Associated Press recently that the agency is hiring dozens of lawyers and immigration officers to review cases of immigrants who are suspected of having lied to officials during the naturalization process. The office made public on July 5 a memo announcing its plan to start issuing notices to appear for a wider range of cases. Those notices, which require an immigrant to appear before an immigration judge on a certain date, can be the first step in deportation proceedings." "The U.S. Department of Homeland Security (DHS) is considering a plan that would drastically and unilaterally restrict legal immigration to only the wealthiest and most privileged applicants. An archaic federal immigration provision called the “public charge” test is currently being drafted by the Trump administration. Immigrants coming to the United States would generally fail this new rewritten test if they had a medical condition and no source of subsidized health insurance. The test also places a premium on an applicant’s income and assets. Applicants must make at least 250 percent of the federal poverty guidelines, which, in 2018, means $30,350 for a one-person household and $62,750 for a four-person household. By comparison, the average American working full-time typically makes around $51,640 for men and $41,554 for women." 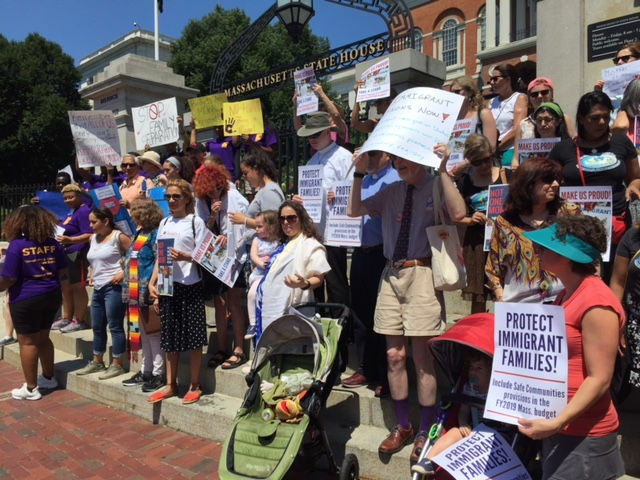 "Advocates for immigrants are continuing to pressure the Massachusetts House to go along with Senate proposals on immigration, amid concerns that those proposals are holding up the already late state budget." There are a number of jurisdictions that are further ahead than Massachusetts is in protecting our immigrant brothers and sisters," said the Rev. Amy Whitcomb Slemmer, who attended a Statehouse rally on Tuesday with others from the Episcopal City Mission. "We want to ensure that communities can be safe, that police can be seen as allies for everyone regardless of their origin of birth." During deliberations on the state budget, the Senate added a controversial amendment relating to immigration. The amendment would prohibit a police officer from asking someone about their immigration status unless required by law. State and local police would not be allowed to act as federal immigration officers. A law enforcement agency that has an immigrant in custody would be required to provide the immigrant or their attorney with a copy of any immigration detainer. Federal immigration officials could only interview someone in state custody with the person's written consent..."
"The federal government is definitely not going to meet Tuesday’s deadline, imposed by federal judge Dana Sabraw, to reunite all of the more than 100 children under the age of 5 separated from their parents at the US-Mexico border under President Donald Trump’s “zero tolerance” prosecution policy. But it’s almost certainly not going to matter. At least 54 children are expected to be reunited with their parents Tuesday. Judge Sabraw has all but promised the government that he’ll extend the deadline Tuesday for the few dozen children remaining — as the government works with the ACLU to try to figure out what a reasonable timetable is to vet parents who have been released from Immigration and Customs Enforcement (ICE) detention and locate those who’ve already been deported. With the deadline looming, the government and the plaintiffs in the lawsuit over family separation (led by the ACLU) are working overtime to hash out a plan to identify and reunite as many families as possible in time. They’re collaborating to share information and track down children and parents — meaning that the ACLU is more interested, right now, in setting a deadline the government can meet than slamming it for missing one. Unsurprisingly, the ACLU has a more aggressive idea of what’s possible..."
"After a federal judge ordered the Trump administration to reunite the immigrant families it has separated, there's been a trickle of stories of parents being reunited with their kids. Nearly 3,000 kids were separated from their parents as a result of the White House's zero tolerance immigration policy, Health and Human Services Secretary Alex Azar estimated last week. The government has not said how many of them were reunited with their parents, and officials have asked for more time to meet one of the reunification deadlines. For the parents and children who have been brought back together, the celebrations may be short-lived. After reunification, they face a series of other obstacles -- including long, complex legal proceedings, and possibly deportation..."
"Tears, hugs and kisses were abundant overnight Friday as 10-year-old Diego Paixao reunited with his mother at Logan International Airport after being separated from her for weeks. "I'm happy because I am back with my mom," Diego said. Paixao’s mother, Sirley Silveria Paixao, sought asylum from Brazil and traveled to the U.S. with permission from the United States Department of Homeland Security, according to a lawsuit filed on her behalf. She passed an initial screening and was deemed as having credible fear in her native country, the lawsuit said..."
"A Guatemalan woman seeking asylum was reunited with her 8-year-old daughter Thursday, nearly two months after they were forcibly separated when they crossed the U.S.-Mexico border. The American Civil Liberties Union of Massachusetts tweeted that the daughter, who was identified only as S.K., arrived at Boston's Logan Airport Thursday afternoon, where she was greeted by her mother, Angelica Rebeca Gonzalez-Garcia, and a crowd of supporters. 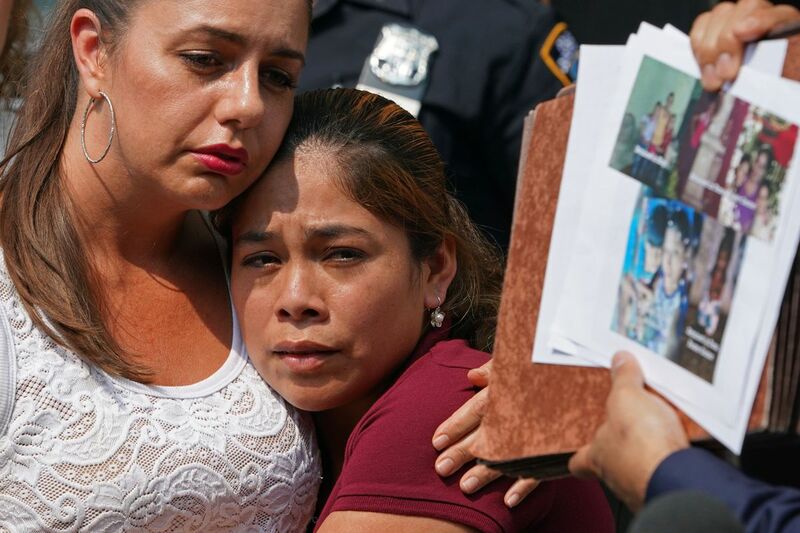 "Forgive me, my child, forgive me," Gonzalez-Garcia can be heard sobbing to her daughter in Spanish as the two embraced in a short video posted in Twitter..."
"The White House’s plan to indefinitely detain immigrant families together threatens the care of young children, experts worry, by placing them with an agency with little experience in handling such complex needs. Previously, the administration’s “zero-tolerance” immigration stance meant splitting children from parents, including 2,322 children 12 and under, and placing the children in facilities run by the Department of Health and Human Service. The policy of detaining families “during the pendency of their immigration cases” was announced Friday night in a Justice Department court filing. But experts and former government officials warn the new approach — which places parents and children in the custody of the Department of Homeland Security for months or even longer..."
"Doctors are speaking out against the Trump administration's plans to stop separating immigrant families by instead detaining children with their parents. That approach, top pediatricians warned Wednesday, replaces one inhumane policy with another. "It puts these kids at risk for abnormal development," said Dr. Colleen Kraft, president of the American Academy of Pediatrics. Kraft, who earlier this month condemned the practice of separating families as "government-sanctioned child abuse," said Wednesday that detaining kids with their parents can be just as detrimental to their healthHaving them in detention is traumatizing and it's not a good place for children," she said. "Children deserve to be with their families in a community-based setting where they can heal." Dr. Lanre Falusi, a pediatrician in Washington, DC, echoed those concerns in a call with reporters, noting that even short periods of detention can cause psychological trauma and mental health risks. Children who are detained display signs of physical and emotional distress..."
"The Trump administration’s sweeping immigration crackdown faltered Wednesday after GOP leaders watched members of their party help defeat a border bill championed by the president and a federal judge ordered the government to swiftly reunite migrant families. By a vote of 301 to 121, the House rejected a wide-ranging GOP immigration bill that would have funded President Trump’s border wall, offered young undocumented immigrants a path to citizenship and partially addressed the family-separation crisis at the southwest border. The vote came hours after the president tweeted that the House should pass the bill to “SHOW THAT WE WANT STRONG BORDERS & SECURITY.” After weeks of negotiations between GOP conservatives and moderates, the vote made clear how split the party..."
"The Supreme Court’s decision allowing the third iteration of President Trump’s travel ban to become permanent immigration policy could have far-reaching effects on the health care system because of a little-appreciated fact: That system relies heavily on foreigners, including foreigners from the list of seven banned countries. In a 5-4 decision Tuesday, the court upheld the current version of the travel ban — which means the administration can refuse some immigrants and visa holders from Iran, Libya, North Korea, Somalia, Syria, Venezuela, and Yemen entry to the US. 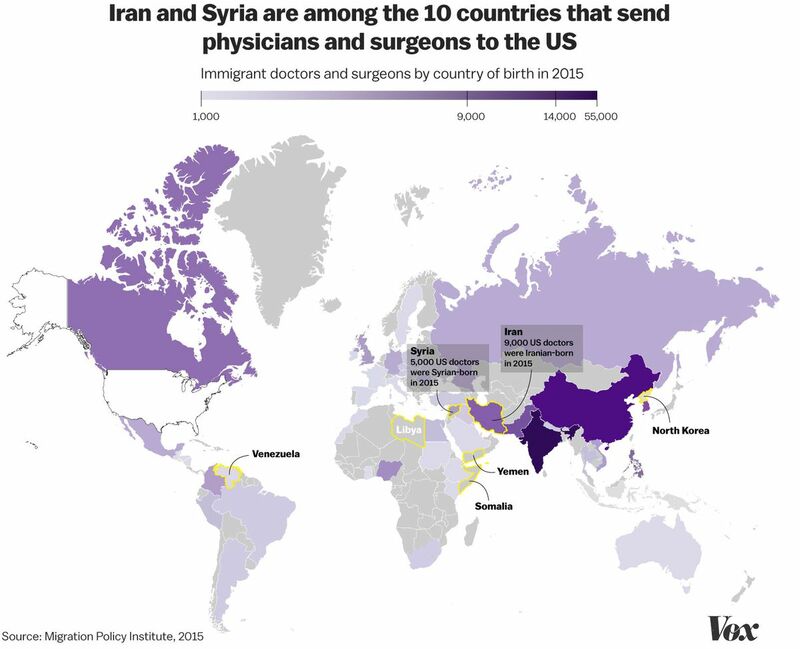 This means would-be doctors, nurses, and home care aides (or their family members) from these countries will have a hard time entering the US, even when they qualify for the administration’s waiver program. In many ways, the health system is already stretched too thin..."
"The fear of family separation is nothing new for many immigrants already living in the U.S. In fact, that fear, heightened in recent weeks, has been forcing a tough decision for a while. Advocates say a growing number of American children are dropping out of Medicaid and other government programs because their parents are not citizens. Marlene is an undocumented resident of Texas and has two children who are U.S. citizens who qualify for Medicaid, the federal-state program for low-income people. (Kaiser Health News is not using Marlene’s last name because of her immigration status.) One of her children has some disabilities. “My son is receiving speech therapy,” she said in Spanish. “But it’s been difficult.” It was a long journey to get the right evaluations and diagnoses, and her son is finally making progress, Marlene said. But she braces for a day when he might have to do without this therapy and others that are paid for through Medicaid. Because she’s undocumented, she’s extremely nervous about filling out applications for government programs like this..."
"Immigration officials in Massachusetts may once again arrest undocumented immigrants who show up for appointments at government offices, marking the reversal of a February directive that had halted the practice, according to a filing Friday in US District Court in Boston. The policy change was revealed in an affidavit filed by Rebecca Adducci, who took over June 7 as interim director of US Immigration and Customs Enforcement’s Boston field office. Adducci said that while the Boston office will “continue to prioritize enforcement efforts toward the apprehension and removal of criminal aliens and those who pose a danger to the community or to the national security of the United States, no classes or categories of removable aliens are exempt from enforcement, including detention.” Her affidavit was part of a filing in a civil case brought by five couples suing the Trump administration and the Department of Homeland Security over the arrests of immigrants who showed up for hearings at government offices. The couples are represented by the ACLU and the Boston law firm WilmerHale, which filed the suit earlier this year. Adriana Lafaille, a staff attorney for the ACLU of Massachusetts, said that in light of Adducci’s policy change, immigrant families might be afraid to show up to appointments or interviews with US Citizenship and Immigration Services..."
"New Jersey, Connecticut, and New York intend to file a lawsuit against the Trump administration over family separations at the border. N.Y. Gov. Andrew Cuomo joins CNN's Wolf Blitzer to explain what he hopes to accomplish. The Trump administration has described Flores v. Reno, known as the "Flores settlement," as the reason it is "forced" to separate parents from their children to prosecute them. The ruling states that children are not allowed to be detained with their parents. Trump's executive order seeks to change this. "Our federal Constitution provides due process rights to citizens and noncitizens, undocumented people," Cuomo said. "If you could have modified the decision, you wouldn't have had the problem in the first place. They couldn't put the children in the detention center once they arrested the parents, so they had to fly 2,000 children to parts unknown." "Now they come back in the executive order and say, we will set up a family detention center and put the child in with the parents," the N.Y. governor explained. "No. You couldn't do that in the first place..."
"President Trump signed an executive order on Wednesday ending his administration's policy of separating migrant children from their parents who were detained as they attempted to enter the U.S. illegally.The action came after a firestorm of protest from administration opponents and allies, reacting to pictures and sounds of young children traumatized by their separation from their parents at the hands of U.S. authorities. "So we're going to have strong — very strong borders, but we're going to keep the families together. I didn't like the sight or the feeling of families being separated," said Trump. He is, in effect, ordering family separation to be replaced with the detention of whole families together, even after previously arguing that "you can't do it by executive order." The president says his administration is trying to balance rigorous enforcement of U.S. immigration laws and pursue its policy of maintaining family unity. He says his administration was put "in the position of separating alien families to effectively enforce the law" because of "Congress's failure to act" and "court orders..."
"Top aides to President Donald Trump are planning additional crackdowns on immigration before the November midterms, despite a growing backlash over the administration’s move to separate migrant children from parents at the border. The goal for Miller and his team is to arm Trump with enough data and statistics by early September to show voters that he fulfilled his immigration promises — even without a border wall or any other congressional measure, said one Republican close to the White House. Among the fresh ideas being circulated: tightening rules on student visas and exchange programs; limiting visas for temporary agricultural workers; making it harder for legal immigrants who have applied for welfare programs to obtain residency; and collecting biometric data from visitors from certain countries..."
"There is no more important story in the country right now than the thousands of parents and children being separated from each other at the border as they attempt to enter the United States. The debate over the crisis has spun off into many tangents: whether there is any federal law requiring family separation (there isn’t), about America’s rules for asylum seekers, and whether Congress will do anything about it as the House prepares to take up immigration legislation this week. But as much as the family separation crisis is a story about immigration policy and our country’s values, it is also a health crisis. Dr. Colleen Kraft, president of the American Academy of Pediatrics, visited a shelter housing unaccompanied minors ages 12 and younger in April. She described walking into a toddler room where, instead of finding a group of rambunctious kids, she found quiet ones and, in the middle of the floor, a little girl crying uncontrollably. I asked Kraft to explain the health risks that come with separating kids from their parents. ”Every bit of their health is predicated on a foundational relationship with a caring adult,” she said. Their parents, in other words..."
Doctors saw immigrant kids separated from their parents. Now they're trying to stop it. "Administration officials have defended the approach, arguing they're protecting children in custody and that separations of immigrant families at the border are no different than what happens when anyone accused of a crime is arrested. But since her visit, Kraft has been trying to convince them otherwise. She's released statements condemning the practice of separating families, warning that children torn from their parents experience serious short- and long-term health consequences. The association she leads -- which represents more than 65,000 members across the United States -- has sent multiple letters to the Department of Homeland Security, calling for a change of course. The pediatricians' group isn't the only one that's taken a stand. So have the American College of Physicians and the American Psychiatric Association. Together, the three organizations represent more than 250,000 doctors in the United States..."
"Texas health inspectors found nearly 150 violations at more than a dozen shelters across the state that are housing immigrant children, The Associated Press reported Tuesday. Violations from the last year at Southwest Key Program shelters include inadequate supervision and lack of timely medical care, according to the news service. Children were also given medications they were allergic to, it added. A spokesperson for Southwest Key, which operates 16 shelters housing 2,600 children, told the AP that the violations found account for less than 1 percent of the standards that inspectors reviewed..."
"WASHINGTON, June 12, 2018 — A Trump administration draft proposed rule affecting lawfully present immigrants who use public benefits or tax credits for which they or their dependents are eligible would sharply expand the number who could find it more difficult to get a green card or renew a visa, the Migration Policy Institute concludes in a new report. The expected public charge rule likely would significantly chill the use of public benefits by legal immigrants and their U.S.-born dependents, the researchers find. A proposed rule is expected soon..."
"WASHINGTON — Attorney General Jeff Sessions on Monday made it all but impossible for asylum seekers to gain entry into the United States by citing fears of domestic abuse or gang violence, in a ruling that could have a broad effect on the flow of migrants from Central America. Mr. Sessions’s decision in a closely watched domestic violence case is the latest turn in a long-running debate over what constitutes a need for asylum. He reversed an immigration appeals court ruling that granted it to a Salvadoran woman who said she had been sexually, emotionally and physically abused by her husband. Relatively few asylum seekers are granted permanent entry into the United States. In 2016, for every applicant who succeeded, more than 10 others also sought asylum, according to data from the Department of Homeland Security. But the process can take months or years, and tens of thousands of people live freely in the United States while their cases wend through the courts..."
"Attorney General Jeff Sessions ruled on Monday that most victims of domestic violence may not apply for asylum in a decision that is likely to condemn thousands of women to brutality. His ruling overturns four years of precedent permitting abuse victims to obtain asylum in the United States. Immigrants who fled to the U.S. to escape domestic violence may now be deported back to their home countries—even when they face near-certain torture and death. Sessions’ decision in Matter of A-B- revolves the proper interpretation of asylum rules. Under federal statute, asylum-seekers may receive relief if they show they were persecuted on the basis of at least one protected trait: race, religion, nationality, political opinion, or “membership in a particular social group.” The Board of Immigration Appeals has long held that an individual fits into that last category if her “social group” shares a “common immutable characteristic” that can be “defined with ‘particularity’ ” and is “socially distinct within the society in question...”"
"Ross has sWhy did Commerce Secretary Wilbur Ross, who oversees the census, approve adding a hotly contested citizenship question to 2020 census forms?aid the driving force is the need for more accurate citizenship data, which he wants to collect during the next once-a-decade headcount of every person in the country as required by the U.S. Constitution. The question was requested this past December by the Justice Department, which says it needs data from the census to better enforce the Voting Rights Act's provisions against racial discrimination. Since the law was enacted in 1965, the federal government has relied on estimates of the citizen population based on Census Bureau surveys involving a sample of U.S. households..."
"A mother and son separated at the border are finally together again. The family was separated shortly after arriving to the county seeking asylum under a new policy by the Trump Administration. “Right now, I’m very happy. Always thankful to God first,” Jocelyn said. Jocelyn's son James was finally returned to his mother’s side earlier this week. We’re only using their first names at the request of their immigration attorney. “I think he's still adapting to everything on the outside,” Jocelyn said. According to experts, James will have a lot of adjusting to do. “Attachment disorders are a difficult disorder to work with and cope with,” Celeste Nevarez said. Nevarez is a therapist with Emergence Health Network..."
"Last year the Trump administration ended a program that allowed 60,000 Haitians, including Fred, to live and work in the U.S. after the devastating 2010 earthquake. Fred's temporary protected status expires in July. "It’s affecting me," Fred said (we're not using his last name because he fears deportation). "The way I live my life. Like right now, I’m shaking. My voice is shaking, and this happens every day to be honest." If Fred is deported, the nursing home will struggle to replace him. The long-term care industry relies on immigrants to fill relatively low-paying jobs, from laundry workers to home health care aides. Ten-thousand people hit age 65 each day. According to federal health officials, half of these baby boomers will need some kind of long-term care, like a nursing home, or a home health aide. The long-term care industry is already facing a labor shortage. And now, plans to cut immigration threaten to make the problem worse..."
"The Trump administration is preparing to release a sweeping plan for reorganizing the federal government that includes a major consolidation of welfare programs — and a renaming of the Health and Human Services Department. The report, set to be released in the coming weeks by the White House OMB, seeks to move safety-net programs, including food stamps, into HHS, two sources with knowledge of the plan told POLITICO. The plan would also propose changing the name of the sprawling department, while separately seeking cuts at USAID and the State Department..."
"When Trump administration officials talk about their “zero tolerance” policy on the southwest border, they’re often lying about what’s actually going on. Last month, Attorney General Jeff Sessions announced that undocumented immigrant children crossing the border would be separated from their families. Since then, President Donald Trump has repeatedly blamed his administration’s own policy on Democrats. Homeland Security Secretary Kirstjen Nielsen has also equated family separation at the border with U.S. citizen children being removed from convicted parents. Parents at the border haven’t been convicted, only charged, and are likely fleeing persecution — and seeking asylum is a right afforded under U.S. law..."
"The Trump administration has signaled its plans to significantly alter the rule on eligibility of applicants for permanent residency and applicants intending to immigrate to the US by redefining “public charge” determinations related to the use of public benefits. This would make it harder to enter the country and reduce access to a broad range of health and human service safety-net programs for immigrants already living here, including US citizen children. The Department of Homeland Security (DHS) is developing a proposed regulation to change the requirements for ensuring that foreign nationals coming to the US do not become dependent on public assistance. In drafts of the proposed regulation that were leaked to the media this year, DHS would require a more expansive list of public benefits to be considered when immigration officials determine whether an applicant is likely to become dependent on public benefits, and thus whether they are allowed to enter the country or to change their immigration status. This proposal is currently under review at the Office of Management and Budget (OMB). After the proposal’s expected publication in July, the public will have an opportunity to comment on the proposal, and DHS must consider those comments before finalizing the regulation. It’s possible that the proposed regulation may never be published, it could be changed in response to public comments, litigation could block the final regulation from implementation, or Congress could amend the immigration law and create a new interpretation and regulations. For now, however, this is where DHS is heading..."
"A potential change to immigration rules regarding public benefits could lead to between 875,000 and 2 million U.S. citizen children becoming uninsured, a new study found. In California, about 1.6 million U.S. citizen children with at least one noncitizen parent use Medicaid or the Children’s Health Insurance Program, according to the Kaiser Family Foundation, a nonprofit that focuses on non-partisan analyses of health policy. That’s about 28 percent of the 5.8 million such children who use these programs nationwide..."
"The Supreme Court has ruled in favor of the Trump administration in the case of a 17-year-old immigrant's right to an abortion, but the American Civil Liberties Union does not see the ruling as a total loss. In an unsigned order with no recorded dissent, the highest U.S. court threw out an appeals court ruling that allowed an undocumented teenager held in federal custody, known only as "Jane Doe," to receive an abortion. The Supreme Court ordered lower courts to disregard the ruling as "moot" because Jane Doe had already undergone the procedure. The court did not, however, make a ruling on the merits of the legal issues presented in the case, writing that the justices did not have to "delve into the factual disputes by the parties in order to answer" the mootness question..."
"Advocates from several community service organizations seized the moment. They walked up and down the lines, handing out manila envelopes that contained instructions for creating child care safety plans: legal documents that establish who will take custody of children if their parents are detained or deported. Advocacy organizations such as the San Francisco-based Immigrant Legal Resource Center are pushing these contingency plans nationwide, in states as dispersed as Georgia, Washington and Massachusetts. Many immigrant families include a mix of U.S. citizens, legal residents and those here without legal permission. Any given day feels like a roll of the dice: Parents are unsure whether a child’s “Dreamer” designation will hold, and children don’t know when a parent might be picked up by authorities..."
"A potential radical change to immigration policy by the Trump Administration could cause many families that include non-citizens to fear signing up for public benefit programs even though they’re eligible for them. If, due to this fear, 15 to 35 percent of U.S. citizen children with at least one non-citizen parent disenrolled from Medicaid or the Children’s Health Insurance Program (CHIP), 875,000 to 2 million U.S. citizen children would lose coverage, the Kaiser Family Foundation estimates. Under the policy that the Administration is considering, U.S. immigration authorities could deem people seeking to lawfully enter the United States and people in the United States seeking lawful permanent resident status (that is, seeking a green card) a “public charge” if they or their family members, including citizen children, receive any of a sweeping list of benefits — such as Medicaid, CHIP, Affordable Care Act marketplace subsidies, nutrition assistance, housing assistance, and refundable tax credits such as the Earned Income Tax Credit or Child Tax Credit. For those deemed a public charge and those who could become one, U.S. authorities could deny them the chance to come to the United States to reunite with their families or to become lawful permanent residents. Under current policy regarding public benefits, immigration authorities focus on cash assistance and Medicaid payment for long-term care, and they generally consider only the use of such benefits by the immigrant, not dependent family members..."
"The U.S. Deferred Action for Childhood Arrivals program, known as DACA, has spillover benefits for the health of the young children of DACA-eligible mothers, a recent study suggests. Researchers found that after DACA was implemented, there was a surge in enrollment of these U.S.-born kids aged 5 and younger in the national Special Supplemental Nutrition Program for Women, Infants and Children (WIC) benefit program. The findings highlight the potential for multigenerational effects of immigration policy and should be considered in ongoing immigration debates, the study authors say..."
Anticipated Immigration Rule to Expand the Definition of "Public Charge"
"Under current immigration regulations, people who are or may become a "public charge" - i.e., dependent on certain government programs - may be denied a visa, permanent residency or citizenship. Although no official proposal has been released yet, a leaked version of the proposed regulation indicates that it would let immigration officials deem a person to be a public charge under many more circumstances. Currently, an applicant for a visa or a change in immigration status may be deemed a public charge only if they receive (1) long-term care, or (2) cash benefits --Temporary Assistance for Needy Families (TANF) or Supplemental Security Income (SSI). Under the leaked version of the proposed rule, a public-charge determination could be based on the immigrant's participation or expected participation in many more public programs AND immigration officials could consider whether any of an applicant's dependent family members-including U.S. citizen children-have received or simply sought access to government programs. As explained in this fact sheet prepared by the Center for Law and Social Policy (CLASP) and the National Immigration Law Center (NILC), benefits that could be considered in a "public charge" determination would include, among others: non-emergency Medicaid, the Children's Health Insurance Program (CHIP), Affordable Care Act subsidies, the Supplemental Nutrition Assistance Program (SNAP), the Special Supplemental Nutrition Program for Women, Infants, and Children (WIC), and comparable state and local programs..."
"The Congressional Hispanic Caucus and 48 women’s organizations said at an event Wednesday that they have sent a letter to Congress demanding reform of Trump administration immigration policies that separate immigrant children from their detained parents. Members of the caucus and the groups spoke at a public event to criticize the Trump administration policies they said harm women, children and immigrant families generally by removing children from their parents and putting immigrants in inadequate detention centers..."
"California is poised to become the first state in the nation to offer full health coverage to undocumented adults even as the Trump administration intensifies its crackdown by separating families at the border. The proposal — which would build on Gov. Jerry Brown’s 2015 decision to extend health coverage to all children, regardless of immigration status — is one of the most daring examples yet of blue-state Democrats thumbing their nose at President Donald Trump as they pursue diametrically opposed policies, whether on immigration, climate change, legalized marijuana or health care..."
"Changes to federal immigration policy under President Donald Trump have triggered a series of standoffs between cities such as Philadelphia, which has a sizable immigrant population, and the federal government. The latest battleground? Public assistance programs, such as food stamps and Medicaid. In a draft proposal, leaked to several news outlets earlier this year, the U.S. Department of Homeland Security proposed expanding the type of information it would consider when deciding whether to allow a visa holder or green card applicant to stay in the country. The proposed policy would take into consideration the person’s use of non-cash assistance programs, including heating assistance; food assistance programs such as SNAP and WIC; the Earned Income Tax Credit (EITC); as well as Medicaid and the Children’s Health Insurance Program (CHIP), among others..". "...This said, it’s deeply disturbing when governmental policy takes direct aim at exploiting this fundamental concept — as a deterrent. Two recent initiatives not only manipulate families into making appalling choices, they increase the risk of long-term damage to children through toxic stress — affecting their brains on a neuroendocrine level. Fear and stress affect developing brains..."
"Just when you thought it couldn't get much worse for immigrants, it could get much worse for immigrants. Under U.S. immigration law, a person seeking a green card through a family relationship must show that they "are not likely to become a public charge," which under current law is someone who is unable to support themselves and thus likely to depend on government benefits for income. Historically, the Department of Homeland Security (DHS) has only excluded applicants based on continuous receipt of cash benefits or long-term institutionalization at government expense, so as not to 'inhibit access to non-cash benefits that serve important public interests...'"
"One in four U.S. children — about 18 million children under age 18 — live with at least one immigrant parent. About 5 million children live with an unauthorized immigrant parent, and nearly 80 percent of these children are U.S. citizens; the other 13 million live with a parent who is foreign born but either a legal resident or a U.S. citizen. These children represent an important part of our nation’s future. Unfortunately, the Trump Administration has taken several steps that have harmful consequences, in both the short and long term, for children in immigrant families and their communities..."
"'Public charge is a concept ... under which the government has determined that someone looks likely to be primarily dependent on government assistance,' Sally tells me. Right now, in 2018, a few groups of immigrants are exempt from being considered a public charge; refugees and asylum applicants, for example. However certain lawful residents or visa holders who receive cash aid from the government are not exempt. Those programs include receipt of public cash assistance for income maintenance, such as CalWORKS, or institutionalization for long-term care at government expense. There are a few situations in which people are asked to demonstrate that they won’t become a public charge..."
"The Trump administration is considering a policy change that might discourage immigrants who are seeking permanent residency from using government-supported health care, a scenario that is alarming some doctors, hospitals and patient advocates. Under the proposed plan, a lawful immigrant holding a visa could be passed over for getting permanent residency — getting a green card — if they use Medicaid, a subsidized Obamacare plan, food stamps, tax credits or a list of other non-cash government benefits, according to a draft of the plan published by The Washington Post. Even letting a child who is a U.S. citizen use such benefits could jeopardize a parent's chances of attaining lawful residency, according to the measure..."
"Santiago, who is Puerto Rican, has reason to worry. Near-real-time data on the opioid epidemic in Massachusetts, produced by the Baker administration, shows the overdose death rate for Latinos has doubled in three years, growing at twice the rate of any other racial group. These numbers suggest the opioid crisis is hitting Latinos especially hard in Massachusetts. State officials say they don’t know why. But interviews with current and former drug users, addiction treatment providers and physicians reveal a range of problems that put Latinos at greater risk of an overdose and death..."
Thousands of Hondurans to Lose Protected Status in the U.S.
"The Trump administration is ending temporary protected status for tens of thousands of Hondurans who have been allowed to live and work in the United States since 1999, following a hurricane that ravaged their country. The decision, expected to be announced Friday, will strip protection from more than 50,000 Hondurans, the second-largest group of foreigners to benefit from the status, according to two officials at the Department of Homeland Security..."
"The new policy could affect a wide range of individuals of all ages, but its impact could be particularly harsh on pregnant and postpartum women and children. Their decision to forgo health care and nutrition assistance could have serious negative consequences for them in both the near and long term. In particular, the children may lose access to benefits that, in their later years, could mean better health, higher educational achievement, more work, and greater earnings..."
"Thursday’s announcement by the Department of Homeland Security that it was terminating the status of a group of federally protected immigrants — this time Nepali — is the latest move by the Trump administration to expel foreigners living in the United States who have some form of provisional status. Nepal is the fifth country whose citizens have lost Temporary Protected Status since President Trump took office, meaning about 250,000 immigrants have been told they must leave the country next year, seek an alternative immigration status, or face deportation..."
"The Trump administration’s crackdown on immigrants may soon create new perils for the health care system if a set of proposed regulations by the Department of Homeland Security (DHS), leaked last month to the Washington Post, are promulgated. The regulations would dramatically expand the definition of “public charge,” a criteria used in immigration law to determine both admissibility to and deportability from the United States. As a result, many immigrants, including many low wage health care workers, may be deterred from using publicly-funded health care benefits to which they and their dependents, including their citizen children, are legally entitled..."
"The addition of the citizenship question would cause census participation to plummet, especially among immigrant communities. In the only Census Bureau preliminary field test currently underway, in Providence County, Rhode Island – down from five test regions in 2010 due to agency budget shortfalls – early results are showing reduced response rates from immigrants and communities of color, even without the citizenship question on the test form. In a research document, the Census Bureau has recognized members of these populations are reluctant to participate due to the current political climate of fear imposed by President Trump’s policies and constant worrisome news stories. Because many immigrant families are living in heightened uncertainty, the addition of a citizenship question would only serve to make them less likely to participate in the Census for fear that it could result in their own or their loved one’s deportation..."
"We rarely see government actively working to make problems worse. But that’s exactly what a draft Trump administration regulation, reported in the March 29 front-page article “DHS targets immigrants who receive public help,” would do by punishing immigrants for feeding their children or going to the doctor. This dangerous idea would force families to choose between meeting basic needs and reuniting with loved ones. The plan would penalize everything from breast-feeding assistance to home heating subsidies. The obvious consequence — as the administration’s draft acknowledges — is a poorer, hungrier and sicker nation. This proposal targets immigrants in line for green cards and eventually citizenship, as well as their U.S. citizen children. It attacks families who pay the same taxes as everyone else and who should have the same access to health care and other supports. And it would widen already alarming racial disparities, because family-based immigrants are overwhelmingly families of color..."
"For the first time since 1950, the U.S. Census Bureau is planning to ask everyone living in the United States whether they are citizens when it conducts its next decennial census in 2020. Anticipating that some immigrants might avoid answering the question, the Trump administration wants to try using other government records to fill in missing responses. The new question would be included at the Justice Department’s request, according to a memo by Wilbur Ross, secretary of the Commerce Department (which oversees the Census Bureau). It would supply block-level data on the citizen and noncitizen voting age population. The Justice Department sought to include the question because it uses data about eligible voters – the citizen voting-age population – to help enforce protections for minority voters (including those who speak languages other than English) under the federal Voting Rights Act. The Justice Department now relies on data from the Census Bureau’s American Community Survey, a sample survey that covers 2.6% of the population each year. The department wants more “scope, detail and certainty” that only the full census can provide to enforce the Voting Rights Act, Ross said..."
"After a long career as a banker and investor, Commerce Secretary Wilbur Ross is no doubt familiar with cost-benefit analyses. That seems to have carried over to his political work. In a memo declaring that the 2020 census would ask U.S. inhabitants whether they are U.S. citizens,1 he wrote, “I find that the need for accurate citizenship data and the limited burden that the reinstatement of the citizenship question would impose outweigh fears about a potentially lower response rate.” The inclusion of the question was a request of the Justice Department, which says that it needs the information to enforce the Voting Rights Act. But Ross isn’t the only one weighing costs against benefits when it comes to the census — respondents do it as well. Demographers and civil rights groups are concerned that under a president who has called for a ban on Muslims and immigrants from certain countries, dramatically reduced the number of refugees allowed into the country and cracked down on undocumented immigrants without criminal records, a citizenship question will push more people to decide that the risks of responding accurately to the questionnaire, or responding at all, outweigh the benefits. And the groups that seem most likely to be put off from responding — immigrants, members of households with immigrants, people living in poverty, among others — are the same ones that are already at highest risk of being uncounted..."
"Immigrants who accept almost any form of welfare or public benefit, even popular tax deductions, could be denied legal U.S. residency under a proposal awaiting approval by the Trump administration, which is seeking to reduce the number of foreigners living in the United States. According to a draft of a proposal obtained by The Washington Post, immigration caseworkers would be required to consider a much broader range of factors when determining whether immigrants or their U.S.-citizen children are using public benefits or may be likely to do so. "At least 12 states signaled Tuesday that they would sue to block the Trump administration from adding a question about citizenshipto the 2020 census, arguing that the change would cause fewer Americans to be counted and violate the Constitution. The New York State attorney general, Eric T. Schneiderman, said he was leading a multistate lawsuit to stop the move, and officials in Connecticut, Delaware, Illinois, Massachusetts, New Jersey, New Mexico, Oregon, Pennsylvania, Rhode Island and Washington said they would join the effort. The State of California filed a separate lawsuit late Monday night. 'The census is supposed to count everyone,” said Attorney General Maura Healey of Massachusetts. “This is a blatant and illegal attempt by the Trump administration to undermine that goal, which will result in an undercount of the population and threaten federal funding for our state and cities.'" "But changes to federal immigration policy are putting both at risk. Haitian caregivers like Nirva, who got temporary permission to stay in the United States after the 2010 earthquake destroyed much of their homeland, now face a July 22, 2019, deadline for returning. If they and tens of thousands of other immigrants with similar jobs and tenuous legal status are forced to leave the country, Americans living with disabilities, serious illness or, like Dicenso, the frailties of old age could find themselves with few options besides nursing homes..."
"A local doctor is taking charge to ensure refugees seeking solace in the city are comfortably integrated into the community. Dr. Elena Cherepanov is the lead clinician for The Refugee Integrated Behavioral Health Care Program at the Lynn Community Health Center (LCHC). She was raised in Moscow and lived there until she moved to the United States in 2000. 'By helping refugees we are not only helping them but we are also helping the community because integrating them into it creates unbelievable synergy,' said Cherepanov, 'They're also survivors who've been through a lot so their presence is greatly beneficial for the community...'"
"Massachusetts has the worst inequality between white and Latino residents of any state, according to a study by the financial news site 24/7 Wall St. that looked at income, housing, poverty, unemployment, incarceration, and educational attainment. Undocumented Latinos, estimated to be about 63,000 statewide, struggle more than others, afraid to speak up about wage theft or even to go to the emergency room for fear of deportation. But even Latino immigrants who are here legally and speak perfect English can be reluctant to advocate for themselves or file discrimination complaints, said Ivan Espinoza-Madrigal, a civil rights lawyer and member of the Greater Boston Latino Network, a collective formed in 2013 to promote Latino leadership..."
"...Day in, and day out, immigrants build this country. We are the ones who cook your food, care for your kids, stock your shelves, pick your vegetables, mow your lawn, and clean your house. We graduate in the top percentile of our classes, pay for our own education, serve our communities, and make lasting contributions to the beautiful tapestry of American culture. Like all Americans, and all New Yorkers, we deserve access to health care—not as a privilege, but as a right..."
"...Según un borrador obtenido por Vox, la administración evalúa una regla que convertiría el uso de algunos beneficios como un factor negativo de alto peso contra los solicitantes de la residencia o de alguna visa, catalogándose a estas personas como 'cargas públicas'..."
"The Trump administration is working on new rules that would allow the government to keep immigrants from settling in the US, or even keep them from extending their stays, if their families had used a broad swath of local, state, or federal social services to which they’re legally entitled — even enrolling their US-born children in Head Start or the Children’s Health Insurance Program (CHIP). "The rule wouldn’t make it illegal for immigrants to use public services that are open to everyone regardless of immigration status, or that are available to their US-born children. But it would make it possible for the government to deny their applications for a new type of visa, or a green card, if they’d used those services. In other words, it could force them to choose between taking advantage of available social services, and their family’s future ability to stay in the United States permanently..."
"Non-citizen immigrants are the canaries in the health care coal mine. Disproportionately poor, non-white, and non-English speaking, and without access to the franchise, they are among the most vulnerable groups in the United States. Consequently, they are often the first to experience the gaps, inefficiencies, and conflicts in our health care system. Meanwhile, anti-immigrant sentiment often spills into health policy debates, as was evident in 2009 when opponents of the bill that became the Affordable Care Act (ACA) focused their opposition on the erroneous claim that it would cover undocumented immigrants. 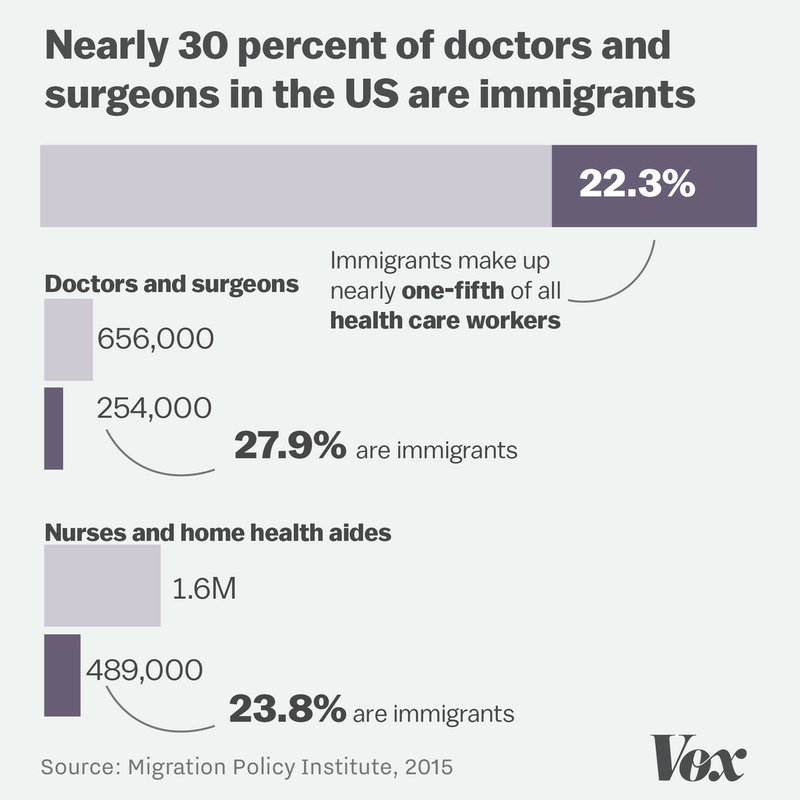 It is therefore not surprising that the first year of the Trump administration, which has focused its domestic agenda on restricting immigration and repealing the ACA, has proven especially perilous for immigrants who need health care..."